This fresh bedroom design-in-progress focuses on a bold, large scale floral as the inspiration source for the room design. 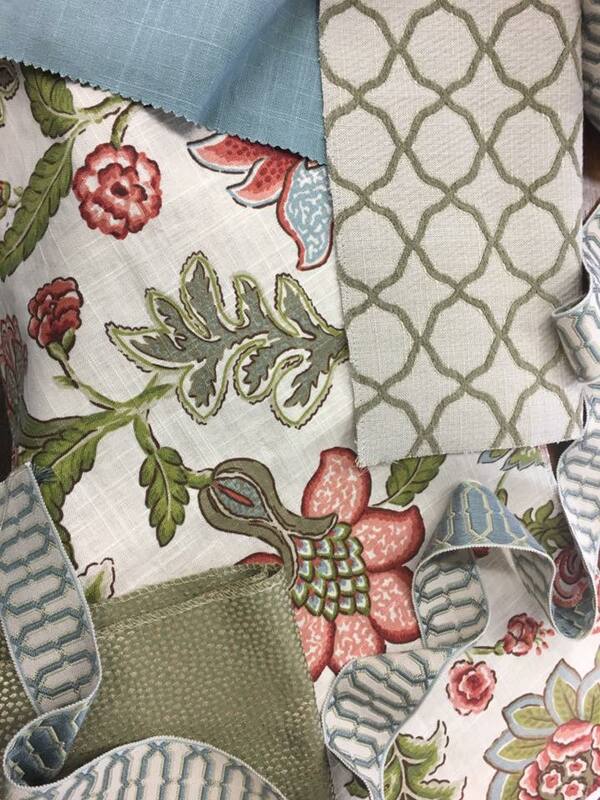 Subtle tones of sky blue in the floral print are pulled out to be accentuated in the form of a beautiful slubby linen and geometric tape trim and the clarity of their value balanced by the mossy and earthy gray-greens in a pebbled solid and chenille geometric trellis to help ground the vivid contrast of the corals and blues. By focusing on the blues and greens in this design the coral then becomes a potent pop that can be further accentuated in lamps, artwork, and accessories and the entire scheme feels soothing and restful- perfect for any bedroom design!